July 26, 2017 - Nationals Park, Washington DC. 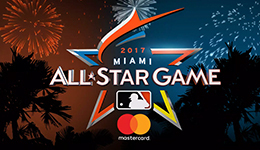 The 2018 Major League Baseball All-Star Game logo was unveiled at a ceremony at the home of the Washington Nationals. 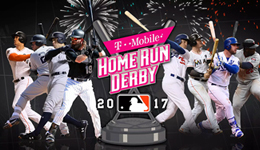 The official logo design was created by Major League Baseball. Gameplan Creative collaborated with MLB Design Services to provide a series of 3-D motion graphic animations to reveal the official logo on the main videoboard during a pre-game ceremony. For the past 15 consecutive seasons, Gameplan Creative has provided an entire package for the 3-day mid-summer classic including videoboard and LED ribbon board animations for the All-Star Game, Futures Game, Legends & Celebrity Softball Game and the T-Mobile Home Run Derby.